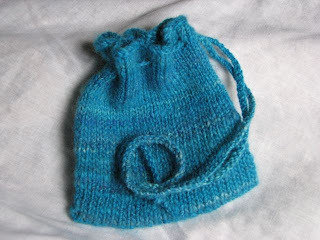 So I took that yarn I made and turned it into a little bag for Natalie. It was 48 sts on US sz 7 needles and I just did a crochet chain for the drawstring. 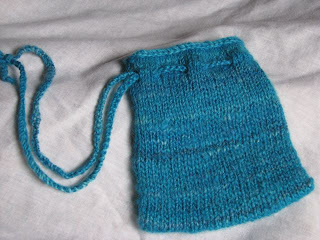 There was a definite difference in the weight of the first skein and the weight of the second...you can see that the stitches in the bottom half of the bag are much bigger than those in the top! 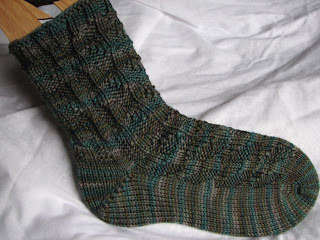 Then this week my aunt received her worsted weight socks and immediately requested more. 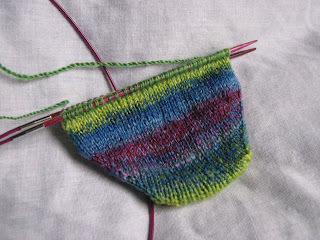 I remembered that I had this sock languishing in the WIP basket from last winter (Lorna's Laces worsted, but the band is long gone so I don't know the colorway), so I pulled it out and finished it yesterday. I also started the second one and am halfway through the foot. 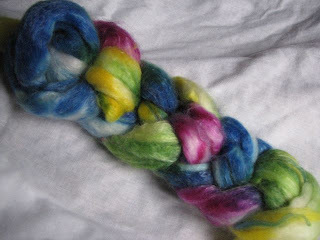 I really didn't plan to start knitting with it right away - and I realize I'm probably tempting fate, but I had a little batch of singles that I wanted to ply and then the temptation was too great and I caved. I'm knitting it on US sz 1.5 needles, for what it's worth. 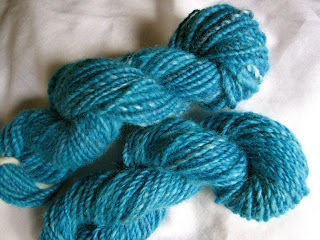 My first proper handspun yarn. 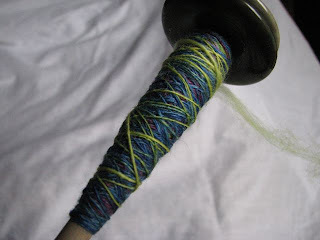 So I bought a drop spindle last year and immediately tried it out. Then I got frustrated and put it away. I've always wanted to try again, but wished I had someone local I could go to for help, or even more convenient, find a helpful video online. Then Erin started playing with her new drop spindle and I knew I had to get mine out and see if I could do better than I had done before. Darn that Erin. I played with the spindle off and on all day yesterday and was finally able to come up with this. 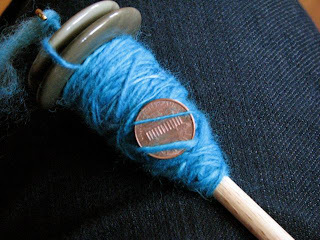 Obviously, it's not terribly even, but the two strands on the penny show the variation I'm getting. Those are pretty much the thickest and the thinnest that I was able to spin. 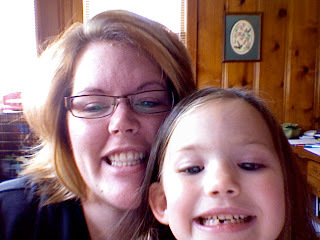 Today's self-portrait proves that I have all of my teeth. Natalie, however, does not. She lost her second tooth this week. However, you can see that her first new tooth is nearly all the way in. So in the past week, my family has gone from planning to move out of state to not moving at all (for the time being, anyway)...from having an offer on our house to having to take the house off the market...from certainty to uncertainty. My husband's business partners have chosen to buy him out, so he will soon be looking for a new opportunity. We are not opposed to moving wherever we need to go, if the offer is right. Right now, it's the not knowing what will come next that is a little disconcerting. I do believe that in the long run, this change of events will be for the best...I'd just like to know what's coming next, you know? The knitting helps a bit. I have several projects on the needles right now, but my new Chevron Scarf is getting the most attention. (not one, but TWO colorways of STR! squee!) I also have a sweater body and most of a sleeve for Natalie, my Gryffindor scarf and a few socks that are in the active WIP bag. Here's hoping for a good buy-out and a new job opportunity! 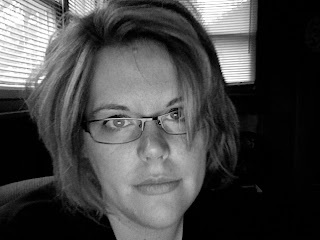 I'd nearly forgotten about Self-Portrait Sunday. Perhaps just as well since today's SPS contains both bed-head and yesterday's makeup. Happy Rose?